Here is a record of our 4 months travelling in 2018 from La Rochelle to Tunisia. Download Nebo from the App store so you can follow us "live" or check this link to see where we are. You can also find us on "Marine Traffic" or "Ship Finder" via AIS. The Google My Map map below shows the whole tour, with each stop, for season 2018. We have arrived at our winter destination. Our aim is to prepare the boat to leave it here for winter and we will be flying back to Australia for a few months to have yet another summer and catch up with family and friends. We have a winterising checklist to work through, as well as a few jobs that fall under the banner of "continuous improvements". ITIKI will be staying in the water for winter and we will have someone local keep an eye on her as well. We hope to have a chance to see a little bit of Tunisia while we are here, even though a lot of places close down over winter. Meanwhile its on to London for a few days and then back to Australia for us. 28th Oct to 8 Nov: Marina di Ragusa has been our base. We hired a car and did a couple of side trips to Siracusa, Scicli and Valley of the Temples, in between getting our solar panels fitted. 27th Oct: Had an awful night's sleep at anchor, really rolly swell and we ended up swinging broadside to. Creaky window didn't help. Left early and glad we did. Had good breeze but very tight angle and again the swell was not great. Had to motor into it for the last 3 hours and a bit of slamming was had. Great to be here in Marina di Ragusa, as it is now blowing 20kts consistently and there is we can see the spray over the breakwater. The marineros helped us tie up and we have already been greeted by some veteran Aussie cruisers on the same marina arm. It will be nice to spend a week here, seems there are lots of social events and we have already met a heap of "liveaboards" wintering here. 26th Oct: Had a really lovely sail, cracked sheets, gennaker and main up. Keith dedicated the day to Matt Owen (aka pillow) who passed away recently. 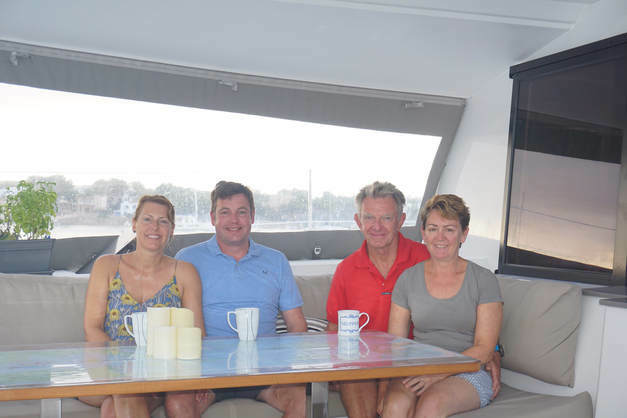 Keith sailed with him for several Hammo race weeks on Local Hero and has some wonderful memories. Really reminds you that you have to live life now, and Mattie certainly did just that. Anchored at San Leone in front of a beach and stayed on board. 25th Oct: Arrived in Sicily, the Egadi Islands to be exact, after a dream crossing which I had to tell everyone about. Click here for the blog. We thought we would spend a night here before making our way along the south coast of Sicily to Ragusa, however when we finally got an internet connection and checked the weather we decided to keep going and try to get to Ragusa a day early, ahead of a Southerly change. There are few protected anchorages along the south coast. Anchored at Mazara del Vallo in the lee of a breakwater and just off the town in view of the old church. Looks lovely but a late arrival and early start tomorrow means an early night on board. 24th Oct: Left early morning from Cagliari to cross to Sicily, lovely clear morning and beautiful sunrise, its going to be a great sail. 22nd Oct: Light breeze initially but built throughout the day. The bay of Cagliari is quite wide and there industrial on the west side. Lots of cargo ships waiting around outside the port. Just as we dropped the sails we saw Luna Rossa speeding across the bay in front of us. The Italian teams HQ and training base is in Cagliari. Check our FB page to see our entrance into the harbour. 21st Oct: Left Caloforte mid morning and skirted around San Antico onto and back to the "mainland" of Sardinia. Spectacular coastline and not much in the way of other boats along the way. As we turned towards our target anchorage we could see no less than 5 masts! Thats the most boats we have seen in an anchorage for some time. Fortunately as we got closer we could see that those 5 masts belonged to 3 boats, all of which looked to be deserted. Tucked in behind a small island facing the beach and had a comfortable night. 20th Oct: Spent the day wandering around Caloforte, skirting around the old town wall and soaking up the vibe. The town was very sleepy in the morning but by the afternoon everyone seemed to come out for a walk and the town square was very lively. Walked along by the old salt pans (salines) which are no longer used for salt but are part of a network of wetlands that serve migratory birds including pink flamingos. Unfortunately none were in residence but there was a very lively kids fishing competition happening at along the nearby creek. Not sure anyone caught anything of note! ITIKI is now at Buggerru! Its a lovely place to see, but there is bugger all to do. Had a blast reach down the coast, blowing 30 kts. Anchored now, the sun is out, the wind has buggered off! 17th Oct: Another short hop down the coast and even managed a little bit of sailing. We are protected from easterlies here in Putzu Idu but the swell seems to be coming from south. 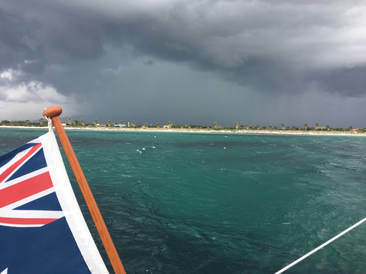 The storm in the photo gave us a bit of breeze to initially, good to check the anchor holding, with but not too much rain. Managed a short walk on the almost deserted beach before it hit and met a german lady who comes here every year! 16th Oct: A short trip down to coast, almost enough breeze for the parasailor, and we are in Bosa. A lovely fishing village on a long river with colourful, narrow houses, overlooked by a castle. We are anchored in the mouth of the river behind an amazingly effective "mole" (a breakwater that is not attached to land), listening to the waves crash outside as we gently bob around. We arrived in the afternoon, very glad to be here and plan to spend some time on land now before heading to Sardinia. We hired a car and drove from one end of the island to the other and back again. Checked out a few archaeological sites. More detail in the latest blog post. We left for Sardinia early Friday morning. 190nm, so should be there Saturday afternoon. ​Managed a tiny bit of sailing on the crossing from Ibiza to Mallorca and put the Parasailor up to try and impress our guests. Sadly the wind did not hold in so down it came. Left it on deck just in case, of course as soon as we stowed it the wind came back! Spent our first night in the lovely Cala Vells a 3 pronged bay with Phonecian caves in one corner. Very interesting to visit these ancient ruins. From there we headed into Palma and managed to drop our guests at a fuel wharf. Could not get a berth for Saturday night so off to anchor in Cala Xinwell, near Las Illetas. 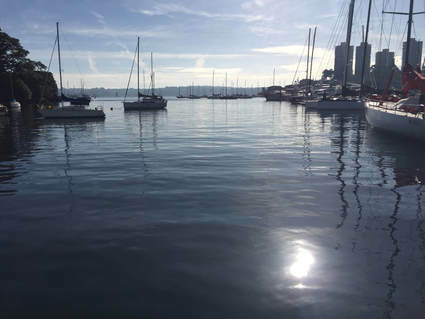 Beautiful and uneventful evening, morning yoga on the foredeck, a paddle around the bay before we headed into the marina in Palma de Mallorca, our first one since leaving the mainland (Cartagena). Our berth wasn't ready so bimbled around the bay for a bit checking out the huge and expensive "shitters" (ie other people's boats). Some incredible yachts here in this absolutely massive harbour. Enjoyed wandering around Mallorca old town, checking out the cathedral and palace and had an excellent dinner. Amy and Harrison have now joined us for a few days, significantly lowering the average age. 17th Oct: A short hop further south, with a little bit of sailing and here we are sheltering from the easterly. Seems the swell is a bit from the south though. Fortunately the storm in the picture has missed us, just a few sprinkles of rain which will hopefully pass overnight. Spent our first night in the Marina, uneventful, having nailed the med mooring despite the starboard line being missing. Watched the mariners try to find it using a big hook, but no luck so the divers will come tomorrow. Meanwhile we used the middle line. Pasarelle fitted perfectly too! Left early, had a bit of a sail and again did the cala crawl, Anchored at Cala Malgrats for lunch and then rejected a few potential spots before finding an (eventually) deserted location at Cala Blanca. Just one other yacht here for the night and it was a lovely still night too. Spent the best part of the day here before heading on another short crawl around a few more bays and settling on Cala d'Egos for the night. Had to fend off one yacht to stop them anchoring on our chain. A small but beautiful bay with no sign of habitation and lovely for swimming and snorkelling. Quite a few strong gusts initially but this died off and we had a quiet night. Lots of goats wandering around the high cliffs of the cala. 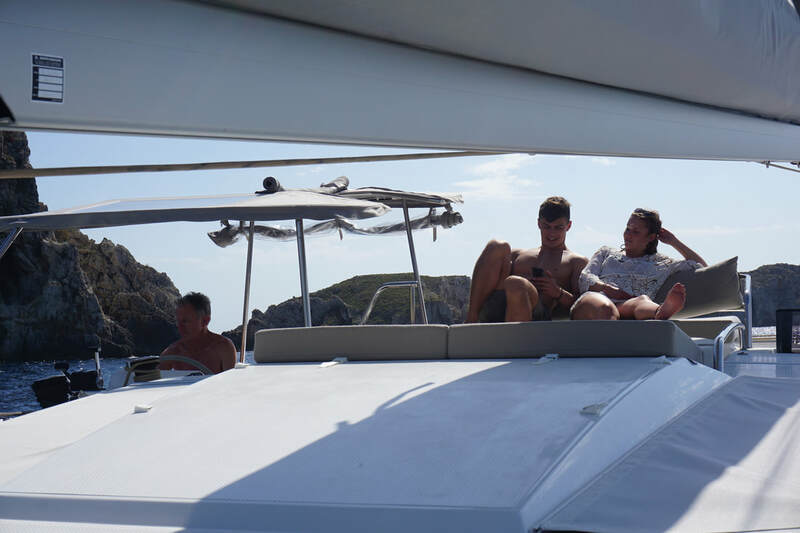 ​Our next stop is a very short distance away so we took advantage of the nice breeze to do some sight seeing around Dragonera Island, which looks like a reclining dragon, and take a peek at the west coast of Mallorca, as we won't be going further. The island is a national park and here are a few photos. Spent one night in the Port of Andratx on a mooring bouy, our first experience with these. Fortunately the marineros help you tie up to it. I think we will be secure on number 53! Quite a charming little town, if not a bit touristy. Had a lovely dinner here with Harrison and Amy and said our farewells. Had a wander around Andratx in the morning before heading going for a sail and heading back to Cala Malgrats for the evening. Only 2 yachts spent the night there. Keith is trying out yet another configuration of hosing on the water maker. It is operating very well on the generator and we can also operate it on the inverter if we need to. Next day we had our longest stretch for quite some time, across the Bahia de Palma heading east as we plan to take off to Cabrera for a couple of days. 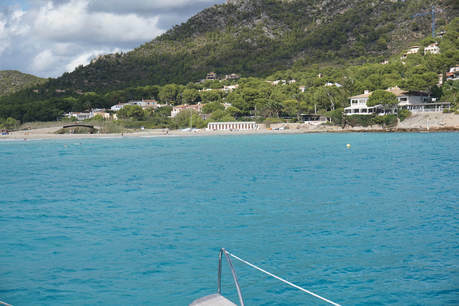 The water at Platja des trenc is the most amazing turquoise colour, like we saw at Formentera. I think we can handle it here for a couple of days. Picked up Debs and Martin at St Jordi and they will be with us for a week. Mistral is honking out of France so we have a strong NE breeze (and equally strong swell) taking us on a nice kite run across from Mallorca to Cabrera. Cabrera (or goat island) is a national park, with limited mooring (buoys only) and very well protected. Its still quite windy and rolly even though the bay is well protected. We have walked to the castle and over to see the lighthouse. Hoping to check out the cuevas azul (blue caves) once the wind and waves back off. Check out the blog post on this lovely island. Back from Cabrera to Mallorca, Coloni Sant Jordi. Bit of a rough crossing banging into oncoming breeze and swell, Mistral easing now. Lots of salt over the boat but she handled it well. Lovely time in the bay here swimming and paddling, walking on the beach and an excellent dinner ashore with our guests. Next day we cala hopped, many beautiful bays but sadly too narrow for us to spend the night. Stopped for lunch at Cala Satyani and watched the rock climbers jumping off cliffs, then on to Porto Petro to pick up a mooring buoy. Next day it was on to a few more calas, again stopping for lunch at Cala Gran, checking out Cala D'Or before heading to Porto Colom. The Calas on the East side of the island are really beautiful but sadly many are way too narrow to accommodate our swing circle, particularly should the weather change overnight. Thats meant a couple of nights "on bouys" in harbours that we would rather not have had. That said we had a loverly dinner ashore with Debs and Martin in Porto Colom before they left us. We had planned to move on the next day however the wind had kicked in from the north (the direction of travel) and the swell would be pretty nasty too. We spent a lazy Sunday (yes I do know what day it is...) and an extra night at Porto Colom, watching the rain squalls and trying to dry 3 loads of washing! Moved on Monday, breeze had backed off a bit but swell still a bit nasty. Checked out a few more calas, beautiful but not great in these conditions and again quite narrow. Finally settled on our second last choice at Cala Canyamel. A beautiful beach with the most amazing turquoise water and some limestone caves nearby. The vista is somewhat spoiled by the ugly hotel blocks on the beachfront and as usual the beach is lined with tourists in deck chairs. Still good shelter and holding so hopefully a good night sleep. We snuck around the NE corner of Mallorca hoping to be tucked up away from the NE winds and swell. The landscape around here reminds me of Iceland, with tall rocky cliffs looming above us. There are no buildings in sight but we can see a few walkers on the shore, exploring the caves and tracks around the area. As we contemplated doing the same ourselves we heard a crack of thunder. Hmmm, lets just get ITIKI ready for some more rain before we go ashore. Well lucky we did, and lucky we didn't go ashore as we copped a thunderstorm which just sat over the NE cape of Mallorca for about 8 hours. The rain was forecast to be 18mm over a 4 hour period, I thought they must be missing a decimal point but after 7 hours of torrential rain I decided they were missing a zero! We collected buckets of fresh water from the the Helia helmstation Niagra falls and the boat sure got a fantastic wash! We heard later that there was severe flooding in Mallorca and several people were killed as a result. Very tragic. We were lucky to be on a yacht really as apart from a couple of strong gusts at the start of the storm (35kts) there really was no wind at all, probably why the storm cell did not move! What a way to end our stay in Mallorca. Headed from Formentera to Ibiza in 20kts with dark clouds looming behind us. Nice to have a sail in some good breeze. Stuck the water maker on just for good measure! Getting along quite nicely but the thunder and rain caught up with us so we quickly dropped the sails and headed into the lovely Cala d'Hort. We have spent 2 nights here with swimming SUPping and some RIB driving lessons for me. I have had to learn the infamous "outboard motor starting face"... Reasonably good paella at one of the local restaurants but certainly not cheap! ​Made our way towards Eivissa (Ibiza) town and did a reconnaissance of a few different bays on the way back. Spent the night in Cala Talamanca outside the main harbour to avoid a E400 per night marina. Spent it on an expensive (and very nice) dinner ashore instead! Not much of an anchorage but practical to re-provision, see the town and pick up our next visitor, the lovely Pammie! Headed to Cala Jondal for the evening and happened upon Sveltana and Trilogy, the small yacht we saw crossing the Gulf of Cadiz, so we joined them for a drink. Meanwhile the party heats up at the local cafe and its a disco all night. After a lazy morning we went out for a sail heading north and back to Cala d'Hort, via the phantom cave, for the night. Rain overnight and quite windy now. Looks like we can go for a sail again today! Headed further north and checked out a couple of calas before settling on Cala Bassa for a couple of evenings. Pam and I hopped a ferry to San Antoni and did a quick shop but mostly a couple of days of swimming, paddling, eating and drinking. 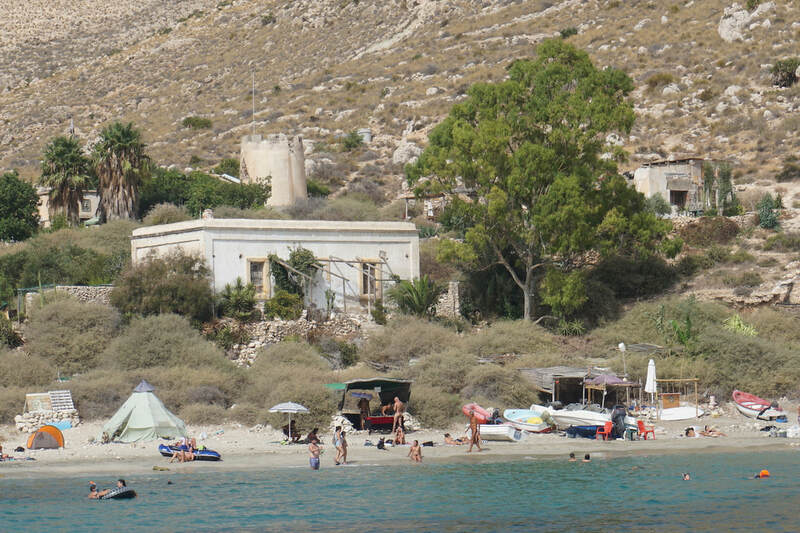 Had another "cala crawl" day today, stopping at the lovely Cala Sardina for lunch and a quick swim. Had the place to ourselves, a deserted cala with no bars or restaurants and seemingly no land access. Here we are at Cala Binerras and plan to stay here for 2 nights. Dinner ashore tonight and Pammie's hubby, Messo joining us tomorrow. Another day, another cala or two. From Cala Binerras via Cala Porcs to Cala Portinatx. Another lovely bay where we went ashore for dinner. On again the next day to Cala Portinatx via Playa Sa Penya Blanca and then on to San Vincent, a lovely sand beach. This will be our last night in Ibiza as we head to Mallorca tomorrow. A 24 hour journey from Cartagena to get here through a weather window. Forecast was not quite as predicted but managed to do a reasonable amount of sailing. Anchored up an a wide bay (Playa de Migjorn) to have breakfast. Had a nap and decided to move to the next bay, Cala Saona, which was less exposed. This place was heaving when we arrived, but lots of day trippers left later in the day so very quiet overnight. Well sheltered. Had a little bit of rain but still quite warm and an overnight thunderstorm on the second night. Gave the boat a good rinse though which was much needed. An amazing town with a lot of history going back to Roman times and with many different religions dominating at various times. About 10 years ago when building a new apartment block they discovered a huge Roman "barrio" or neighbourhood which is slowly being uncovered and a museum is planned for he basement of the apartments. Nebo log here: An easy day of motoring in light breeze although we did manage to get the kite up for 15 mins. The guy at the marina Almerimar recommended this place (Cala San Pedro) although he did warn us it was "full of hippies". He didn't mention that they were in various states of undress but in a very good state of mind! Water temp 29C and crystal clear. Yes! this is what we came for! According to Navily reviews we were are in for bongo drums and guitars later on, disappointed on that front!Such a lovely spot we decided to stay an extra day. 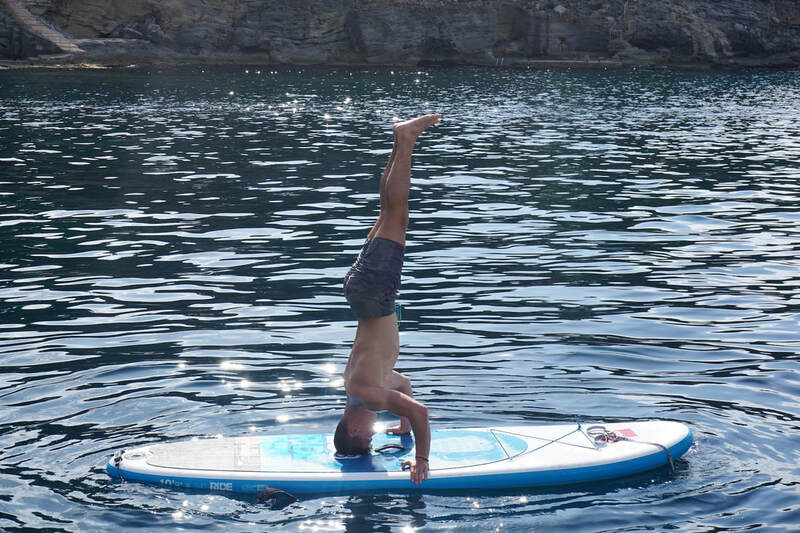 Got into the swing of things with some yoga on the foredeck, SUP to explore the coast and not much else really.